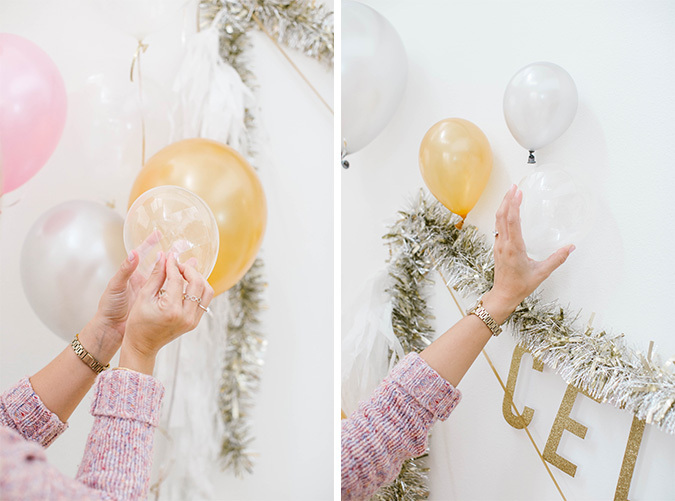 DIY: A Balloon Photo Backdrop for New Year’s Eve! 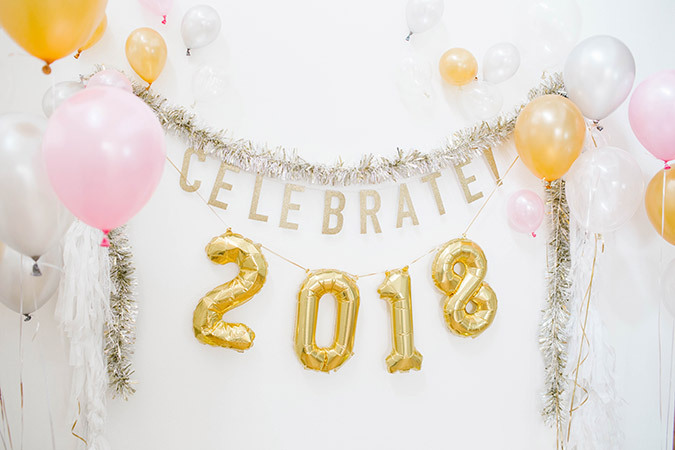 This post is sponsored by Balloon Time, a brand we love and use for so many of our celebrations! Is it just us, or is this holiday season flying by? It’s hard to believe that it’s already December, and that New Year’s Eve will be here before we know it. 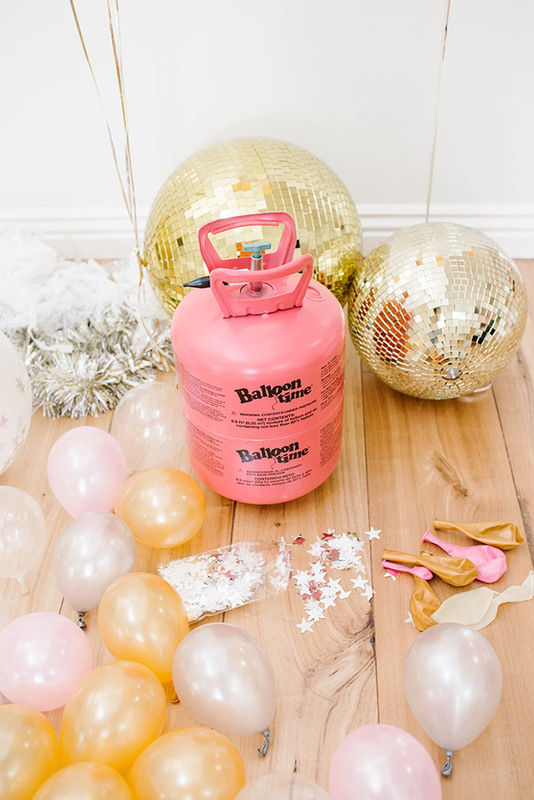 We love any excuse to throw a good party, so to prepare for this year’s NYE celebration, we partnered with Balloon Time Helium Tanks to create the centerpiece to your soiree: a photo backdrop! 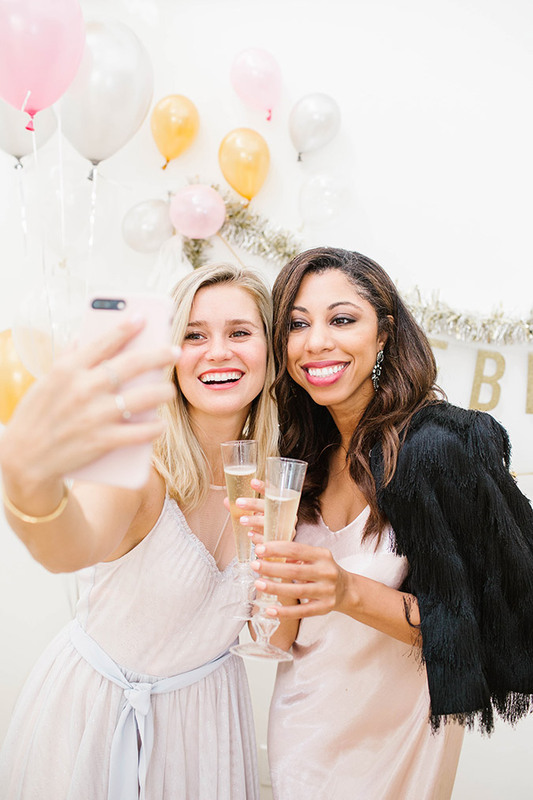 Taking photos of you and your besties as you ring in the New Year is half the fun of the entire evening, so we wanted to put something together that would serve as the perfect backdrop for any and all photo opps. 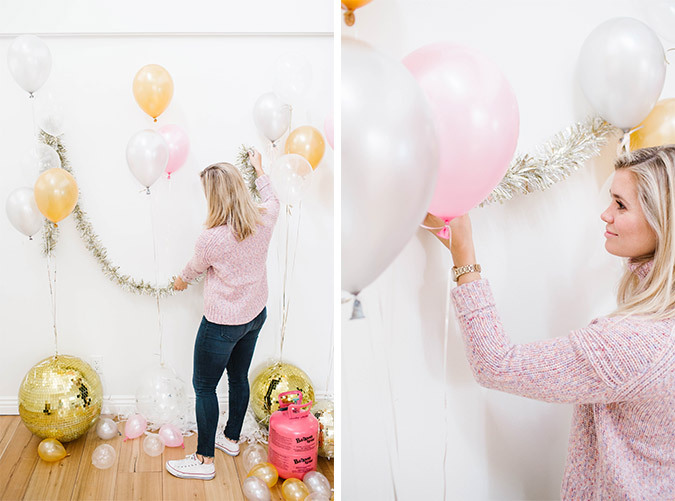 Using our trusty Balloon Time Helium Tank, tons of balloons, a few disco balls and a touch of tinsel, we crafted up a fun and festive backdrop that’s guaranteed to be Instagrammed over and over again. 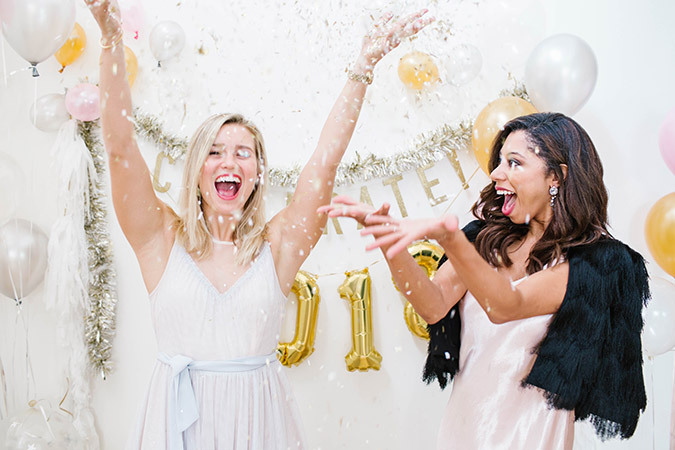 Here’s how to create one for your own NYE festivities. An assortment of large and small balloons, in the color palette of your choice. We used gold, silver, clear and pearlized pink. 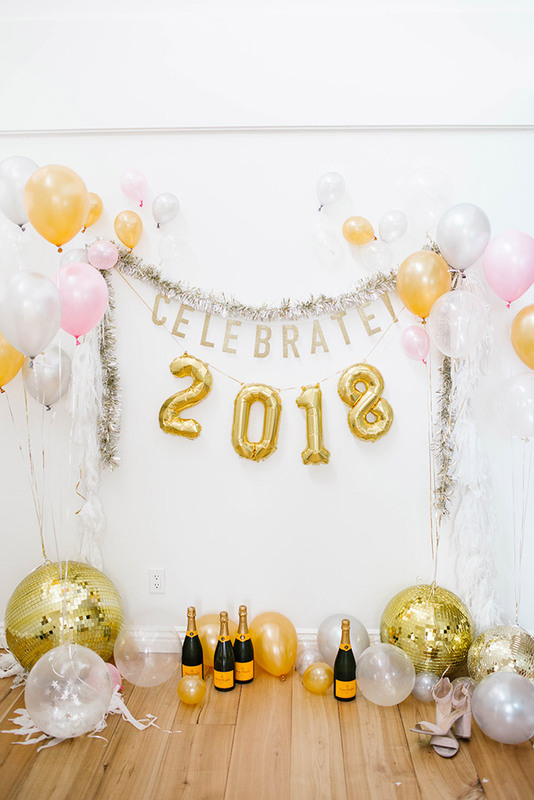 As far as props for the photo backdrop, we also added bottles of Champagne, white tassel garlands, party poppers and fun accessories like a top hat and heels. 1. 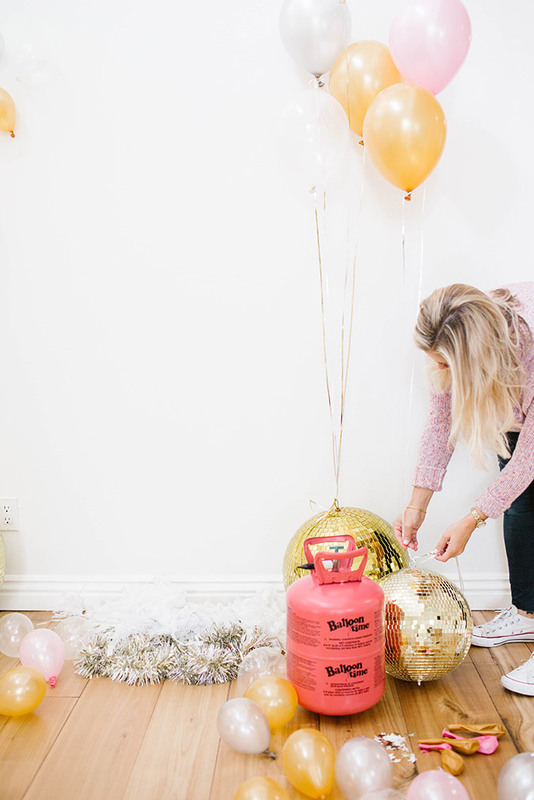 We used our Balloon Time Helium Tank to blow up a bunch of 11″ gold, silver, clear and pink balloons to frame our photo wall. Then, we tied some sparkly string to them, and tied the string to the tops of our disco balls to anchor them. However, if you’re setting up in a space that has low ceilings, you can let the balloons loose and have them float to the ceiling. 2. We also blew up some 11″ balloons with regular air and kept those on the ground to create varying heights and levels for our photo backdrop. 3. To add a little something extra, we filled a few balloons with confetti. 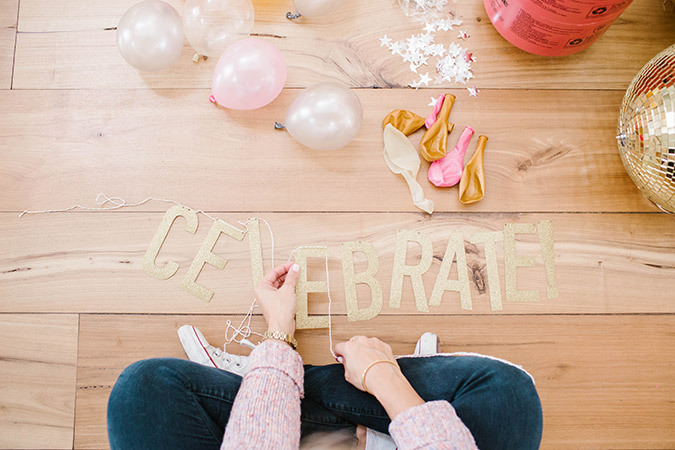 We used a small cardboard funnel to add star-shaped confetti and loose glitter to large, 18″ clear balloons. 4. Then, we blew these up (you can use your Balloon Time Helium Tank if you’d like these to float, or just blow them up by mouth if you’d prefer them on the ground) and tied them off. 5. We then hung a sparkly tinsel garland across two clear command hooks. 5. 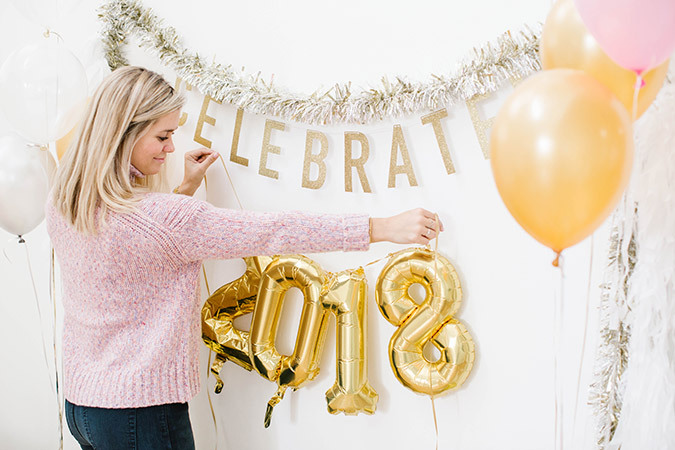 Next, we blew up our mini gold mylar “2018” balloons, and hung them across the command hooks as a garland with string. Then, we added the gold sparkly ‘Celebrate’ garland above. 6. 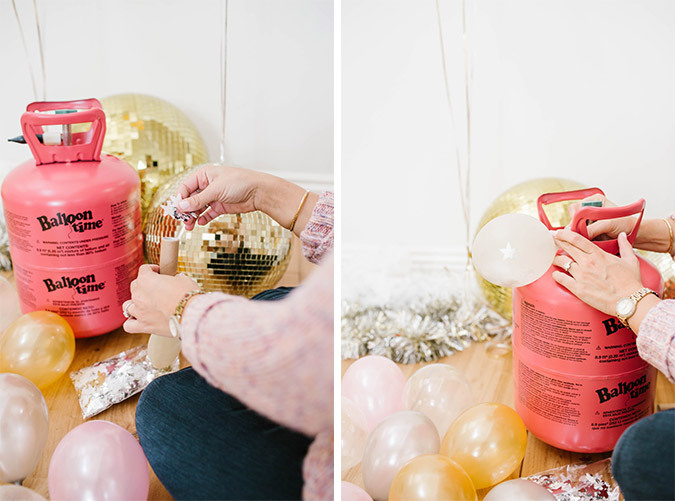 Lastly, we used our Balloon Time Helium Tank to blow up mini 6″ balloons in corresponding colors, and used double sided tape to stick these to our photo wall. We wanted them to look like little Champagne bubbles floating above us! 7. 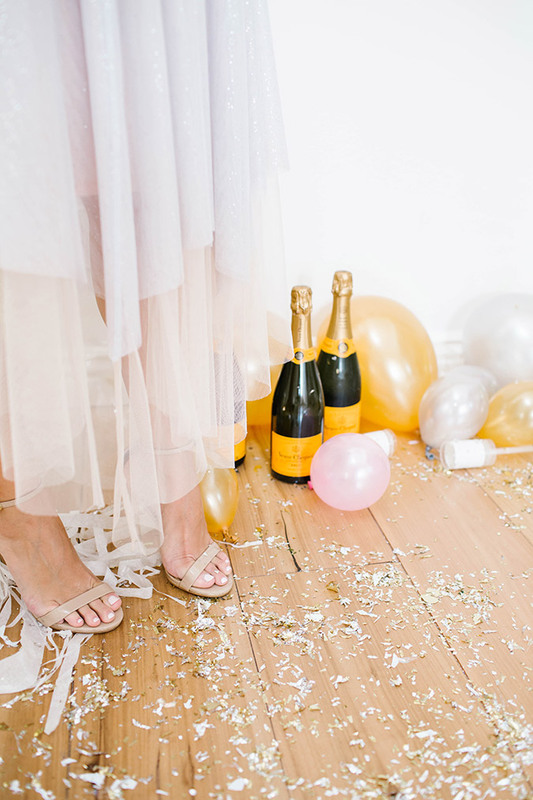 And for some finishing touches we added some items as props: bottles of Champagne, white tassel garlands, confetti, party poppers, and accessories like a top hat and heels. Once the backdrop was set up, it was time to start snapping some photos! If you ask us, this is the prettiest way to ring in 2018. 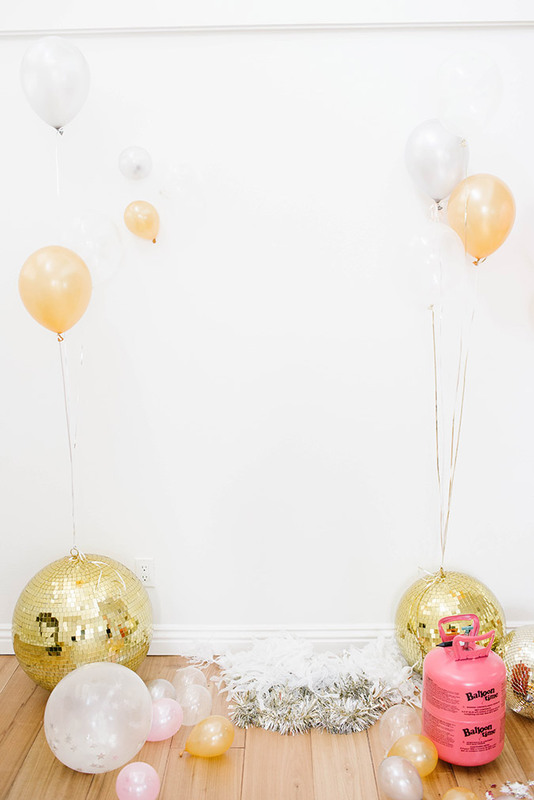 Can’t wait to recreate this backdrop in a few weeks for our New Year’s Eve party! 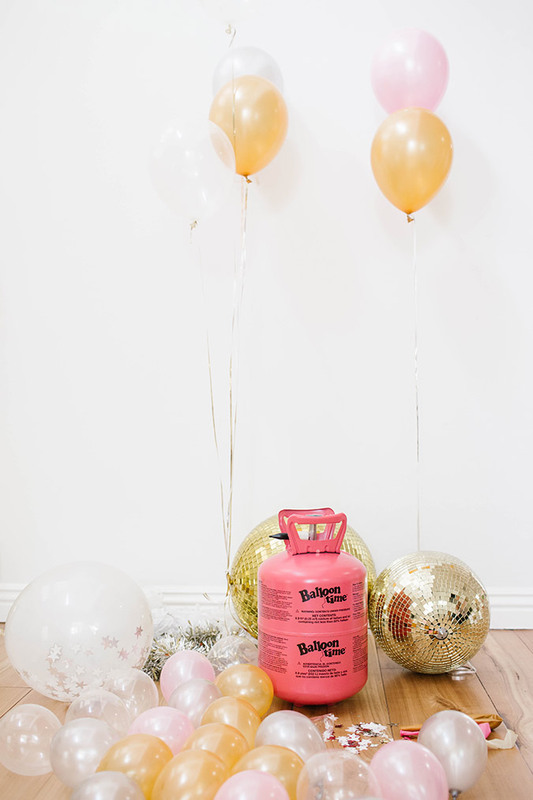 If you want to craft up your own photo backdrop like the one we put together, you can order your own Balloon Time Helium Tank by clicking HERE. 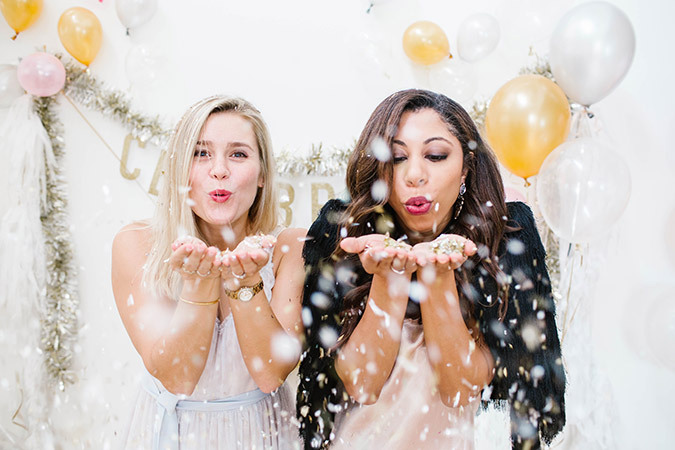 What do you have planned for New Year’s Eve?